The anime adventure also known as 'Onigamiden' soaring to Blu-ray in October has now been fully detailed. 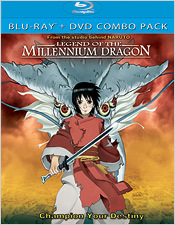 As previously reported, Sony says 'Legend of the Millennium Dragon is planned for Blu-ray release on October 4. From Studio Pierrot, creators of the classic 'Naruto' and 'Bleach' films, comes the stunning new anime adventure 'Legend of the Millennium Dragon.' Based on Takafumi Takada’s beloved 2-volume novel of the same name, 'Onigamiden' (in Japanese) tells the action-packed story of a 15-year-old boy named Jun Tendo who is thrust back in time 1,200 years into the middle of an ancient battle between Oni (demons) and humans. Hirotsugu Kawasaki, who previously directed 1998’s 'Spriggan' and 'Naruto the Movie 2: Legend of the Stone Gelel,' brings his unique visual flair to this high quality epic, which also features spectacular character design by Tetsuya Nishio ('Naruto,' 'Ghost in the Shell: S.A.C. 2nd GIG'). The Blu-ray will feature 1080p video, a DTS-HD Master Audio 5.1 soundtrack, and supplements include a concept art gallery. Suggested list price for the Blu-ray is set at $45.99. You can find the latest specs for 'Legend of the Millennium Dragon' linked from our Blu-ray Release Schedule, where it's indexed under October 4.